Join PMA First Ladies for brunch and learn about the lucky tradition of Cascarónes. 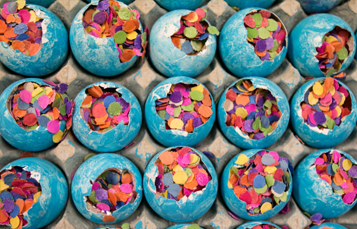 These colorful, confetti-filled eggs are a staple of the annual festivities and Easter in south Texas. People from across the city take part in making, selling and joyfully destroying the eggs as part of the tradition. While they take mere seconds to crack over the heads of loved ones, cascarónes are the product of hours of work that spans nearly an entire year following the annual Fiesta celebrations in San Antonio. Fee is included in spouse/guest registration. Please indicate if you will attend on the registration form. Built in 2001, The Palmer Course at La Cantera was designed by the legendary Arnold Palmer and was voted the #8 golf course in Texas by Golf Magazine in 2016. This 6,926‐yard, par 71 masterpiece winds through the Texas Hill Country and offers the ultimate test of ability for even the most skilled player. Pricing $200 per golfer and includes 18-hole greens fees, golf cart, box lunch, bag storage, unlimited practice range use and practice balls. Dress Code No denim. Collared shirt is required for men. Collared shirt, golf shirt or golf blouse required for women. Transportation The course is located on the grounds of the La Cantera Resort and can be accessed via shuttle or walking to the pro shop. Rental Equipment Rental clubs are available for $72 per player and includes a sleeve of six balls. Please register and prepay for your clubs during the conference registration process, if clubs are needed. If you register for club rental, your selection will be prepped and ready for you on your cart prior to the shotgun start. Please check in at the pro-shop prior to the start of the shamble. Club Storage If you are bringing your own clubs to San Antonio, you can check them with the hotel bellman upon your arrival. Your clubs will be tagged and kept in the bag room at La Cantera. The bag room is secure; it is locked, has an alarm and includes video camera surveillance at all times. On the day of the outing (or if you choose to play additional rounds) call the pro shop before leaving your room and your clubs will be pulled and waiting for you. If you prefer to keep your clubs with you, simply bring them down on the day of the outing. Tee Times For individual tee times throughout week of our meeting, you may begin to call the pro-shop 90 days in advance to schedule tee times, or by going online at La Cantera Golf to book a tee time. Please note that fees vary throughout the year. 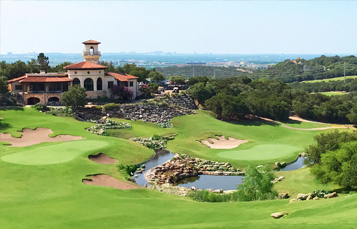 March is a high-demand golf season for La Cantera Resort. Prizes A $100 hotel gift card will be given to each foursome member of the winning team for the overall shamble. A $50 hotel gift card will be awarded to each person mastering the following contest holes. There is no better way to spend a beautiful day in Texas than by horseback riding in the great outdoors. Riders of all expertise levels are welcome. 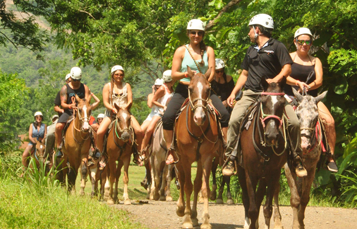 Put on your cowboy boots for western-style riding on shady, wooded and very scenic horseback trails. Come enjoy the views, fresh air and tranquility! $182 per person and includes transportation, bottled water on the vehicles, knowledgeable guide, admission and gratuities. Please meet in hotel lobby at 12:00 p.m. for lunch provided by PMA and a 12:30 p.m. transportation departure. Dress Code: Long pants and closed-toe shoes recommended. This tour is a rain or shine event. 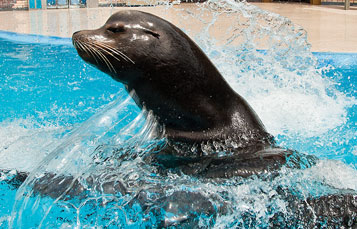 SeaWorld’s Seafari Tour is a guided tour designed to visit the animal attractions in the park when it is closed to the general public. The tour will visit Zoological Support, Pacific Point Preserve, Discovery Point, Explorer’s Reef and Penguin Encounter. Please Note: $215 per person and includes transportation, bottled water, knowledgeable guide, admission and gratuities. Dress Code: Comfortable clothing and footwear are recommended. This tour is a rain or shine event. The tour will start at the Battle for Texas Alamo Museum. In this interactive museum, you’ll learn all about how heroes David Crockett, James Bowie and William B. Travis fought and fell in the name of Texas. While the Battle of the Alamo was far from a victory, it invigorated and inspired Texans to rally for their independence. 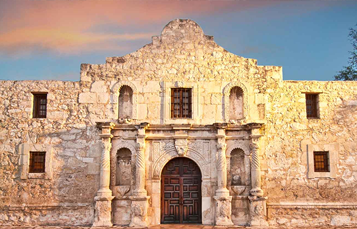 After the museum tour, you’ll walk to the Alamo to see the UNESCO World Heritage Site for yourself. All aboard! After touring The Alamo, you will cruise down the San Antonio River in a chartered river barge. We invite you to relax and take in the picturesque surroundings while learning about the San Antonio Riverwalk culture and history. Finally, guests will experience firsthand some of San Antonio’s Hispanic heritage at El Mercado, which is the largest Mexican market outside of Mexico. Take in the rich history and culture of El Mercado as you explore the rows of authentic Mexican food and spices, jewelry, clothing and other crafts. Please Note: $185 per person and includes transportation, bottled water, knowledgeable guide, admission and gratuities. As of 2.7.19 the Alamo Tour has a Max Capacity of 70 people due to barge / transportation availability.